Much of the transformation had to do with enlarging the port area and building new facilities for shipping. The final touch in that transformation didn’t come until the construction of the new Maritime Passenger Terminal (photo, right) in 1939. It is of the same monolithic architecture as the main Post Office, also a product of architecture under Fascism. Large and imposing, they represent the last great building splurge in Naples until the very recent investment in skyscraper technology in the new Civic Center (Centro direzionale) at the extreme east end of town. The clearing of the area around the port during the 1890s affected Piazza Municipio and the entire east-west axis along the old port, doing away with many of the buildings from the 1700s and leaving intact only a few bits and pieces of the old city wall for reasons of historical interest (one of which is the nearby Church of the Incoronata on via Medina). The present day Municipio (City Hall) (photo, left) at the north end of the square is called Palazzo San Giacomo (also known as San Giacomo degli Spagnoli) because it incorporates an ex-monastery of that name built by the Spanish in the 1500s. (The adjacent church of the same name still functions as a church. 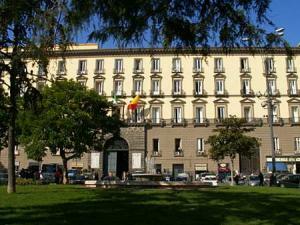 The Municipio, itself, dates back only to the early 20th century. It was an example of advanced architectural technology at the time, utilizing glass for an internal passageway that connected the square in front with the main street, via Toledo in the rear. That advantage was undone by the later construction of the Bank of Napoli on via Toledo, effectively closing the passage. Thus, the entire square, from the port to the Municipio is spacious and grand, and it was from here that the urban renewal of Naples in the late 1800s started. update Nov. 2014 - The Italian Touring Club (TCI) has announced that the church of Saint James is one of the four in Naples-, typically closed to visitors in the past, that is now regularly open (!) to visitors as a result of the TCI's cultural heritage initiative called Aperti per voi (open for you). The program enlists volunteers throughout Italy to act as guides and, in general, help with the necessary work in keeping such sites open. In Italy, the volunteer organization has sponsored some 60 such cultural sites. See this Miscellany link for the others. Virtually all of the buildings, including the nearby Galleria Umberto represent the new idea at the turn-of-the-century of building shop and office space for the middle-class. From Piazza Municipio, then, the clearing continued to the east down to Piazza Bovio where the beginning of a new broad avenue, Corso Umberto, would be built. The current (2008) (updates, below) excavation and construction in the middle of the square is for the "Municipio" stop of the new underground Metropolitana train line. It will connect to stops further east at Piazza della Borsa, then via Duomo, and, finally, the central train station at Piazza Garibaldi, essentially running parallel to and over the walls of the ancient Greco-Roman city of Neapolis. What is now Piazza Municipio was well outside those walls, but, nevertheless, the digging has uncovered some interesting archaeological finds, including the outer fortifications of the fortress, erected by the Spaniards in the 1500s and even some Roman ships. 2. Historical Overview - it helps to read the item above this one first. The postcard shown on the right is quite ordinary. It's a run-of-the-mill tourist card from the mid-1960s of Piazza Municipio, taken from the Municipio (city hall) itself, Palazzo San Giacomo, at the top of the square. The rectangular piazza runs almost exactly NW at the top to SE. 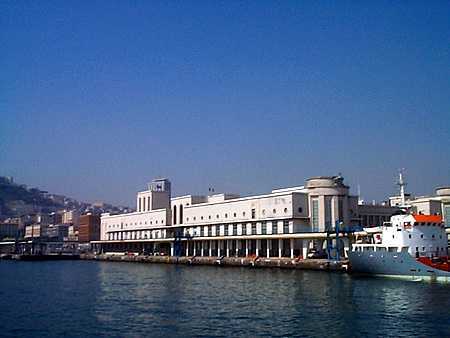 The large white twin facade of the main passenger terminal of the Port of Naples (from 1936) is seen across the main port-side road at the bottom. The Angevin Fortress (Maschio Angioino) is slightly out the picture on the right. Mt. Vesuvius, dead center, is the only landmark to convince you that the other view (below) on this page is from the approximately the same spot, because the square has undergone some major changes since the late 1700s. Actually, this is how Piazza Municipio still exists in the minds of many Neapolitans although it has not been even remotely like this since they started tearing it up many years ago to put in a mammoth underground train station. Although much of the underground work is now finished, the surface work is not yet completed and the area is cluttered. In theory, with some cosmetic changes on the surface (a statue, entrances to the metropolitana, trees, etc.) the square will again look something like this sooner or later. As noted in the main article (above) this large open rectangular space is a configuration that goes back to the urban renewal of Naples, the Risanimento (1885-1915). The square was opened in 1897. Before that, however, things looked quite a bit different. The image on the right is obviously from the same vantage point as the post card, with the angle slightly shifted such that the large fortress, the Maschio Angioino comes into view on the right. The image is a lithograph by M. Zampella, done in approximately 1880. We know that from various things such as the dress of the persons, the fact that there is no motorized traffic, etc. but mainly because we know the history of that large building in the middle; it was torn down in the risanamento in order to start clearing out the area for what was to come —the isolation of the Maschio Angioino by removing centuries of antiquated clutter and to build the new Piazza Municipio. That building was the Gran Guardia della Cavalleria, a cavalry barracks (architect: F. Sicuro). It was on the perimeter of the outer defenses of the old fortress, at was called the couterscarp, the outer slope of the ditch or moat. The Gran Guardia was built in 1790, a time when such castle defenses were still relevant. The road we see in the lithograph was called the via del molo [Port Road]. The fortress, itself, is from 1302; between that time and the risanamento in the late 1800s —500 years!— the area was a hub of civic activity, modified and improved upon by the likes of Domenico Fontana, the architect of the Royal Palace, in 1600. It was not called Piazza Municipio because there was no municipio! Palazzo San Giacomo (now the city hall) was originally a hospital and monastery adjacent to the church of San Giacomo and converted to a new Ministerial Building in the 1790s. The whole area was called Largo del Castello (Castle Square) because everything was centered on the Maschio Angioino. From the vantage point of the artist, the distance from today's city hall to the castle, itself, is 250 meters. Adjacent to and behind the barracks there developed a vast conglomeration of secondary structures such as shops, dwellings, storehouses, etc. —a small village unto itself, running all the way back to walls of the fortress. All of that was cleared by the early 20th century.